Our state-of-the-art fitness center is designed around accessibility. 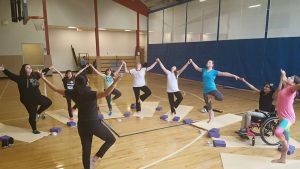 Our fitness programs allow individuals to experience a continuum of care post-physical therapy that exceeds traditional settings. Our line of specialized fitness equipment includes: Recumbent Cardiovascular Exercise Machines, Wheeler's Paramill, EZ Stand Standing Frame, Free Weights, Cybex Bravo-Pro Cable System, and more! Illness & Injury can be life changing. So are we. At Oak Hill we recognize the benefits of structured group exercise. Engaging in group fitness helps to keep motivation levels high and provides an increased opportunity for social interaction. All of our group classes are taught by certified professionals and can be modified to suit any skill level or ability. Let Oak Hill be your next step for personal fitness! Join today for a rewarding program that will safely challenge your body. At Oak Hill, experienced certified personal trainers carefully consider, adapt and create customized exercises to suit each member based on your own personal goals and abilities. Chosen by sports medicine experts, top athletes, and trainers as the best low impact running or walking training tool, the anti-gravity treadmill is a new way to improve your fitness, lose weight, and train smarter. AlterG sessions are by appointment only and will be conducted under the supervision of an Exercise Physiologist. Ultimate training tool for strength and conditioning, cardio and athletic training. 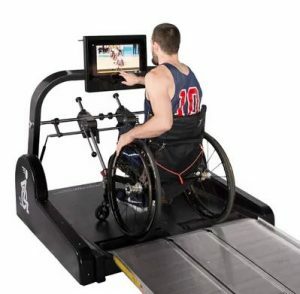 The Paramill (wheelchair treadmill) offers manual wheelchair users the opportunity to achieve cardio workouts, strength conditioning, pulse and heart rate monitoring. SCI rehabilitation and athletic training exercise. The Paramill allows for stationary observation by our trainers with performance and growth tracking capabilities. Accessible to both standard & athletic chairs, the Paramill's split roller option allows for customized rehabilitation and training in both forward or reverse motions. "The trainers are very knowledgeable and make themselves available to us. It makes getting there and working hard easy. My ALS diagnosis changed how I have to maintain my physical health and nowhere but Oak Hill could help me do that. I enjoy being a part of the family and go as much as I can."